Head of Group: Professor John Shrimpton The Group is engaged in leading-edge research in fundamental fluid dynamics, computational aeroacoustics, applied aerodynamics and flight dynamics. Our members include experts in theoretical, computational and experimental fluid mechanics and we aim to provide an environment in which these different approaches can be combined and focused on particular topics with practical relevance. Our research often involves the coordinated use of experiments and simulation, together with associated modelling and theory. Experiments are used to provide fundamental insight into fluid flow and enable validation of computer codes. One of our important research areas is exploring the improvement of computer simulation tools. Practical applications of computational fluid dynamics (CFD) are often limited by numerical methods, flow models and a lack of data for validation. The principal difficulties relate to problems involving transition to turbulence and turbulent flow itself. Recent progress in simulation techniques offers new opportunities for exploitation within the Group, which is at the forefront of developments in direct and large-eddy simulation of turbulence. Currently, there is no universally applicable CFD code. Our strategy is to develop codes suitable for particular fluid flow phenomena. As a result, we have considerable expertise in code development, validation and optimisation for different scalar and parallel computer architectures and we collaborate closely with high-performance computer centres in the UK. We continue to enjoy close connections with the aerospace industry and have achieved Defence and Aerospace Research Partnership (DARP) status in Rotorcraft Aeromechanics and in Modelling and Simulation of Turbulence and Transition for Aerospace. 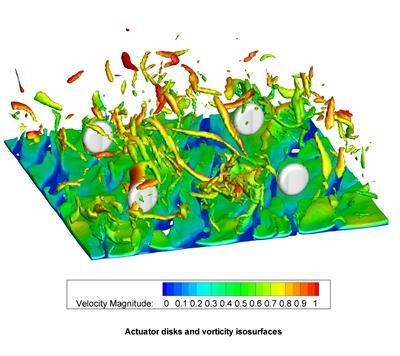 We also host the UK Turbulence Consortium, exploiting national high-performance computing resources for simulation of turbulent flows. The group has excellent computational and experimental facilities. A range of high performance workstations are available, supplemented by local parallel computers based on commodity processors. Additionally the UK Turbulence Consortium, which is led from within the group, provides access to the largest supercomputers in the country. A range of wind tunnels are used for research. The two largest facilities have test sections measuring 3.5m by 2.6m and 2.1m by 1.7m respectively and are equipped with rolling roads, three-axis laser doppler anemometry and motor drive systems for propeller testing. Further facilities allow research to cover the full spectrum of low-speed, transonic, supersonic and hypersonic flow. A flight simulation laboratory is being used to develop cost effective simulation tools for the aerospace industry. Income from commercial use of the wind tunnels is re-invested to maintain the tunnels as state-of-the-art facilities. Our current improvements are working towards tunnel cooling and advanced instrumentation. Huang, X., & Zhang, X. (2011). Plasma actuators for noise control. International Journal of Aeroacoustics, 9(4-5), 679-704. Kim, Y., Xie, Z-T., & Castro, I. P. (2011). A forward stepwise method of inflow generation for LES. In Recent Progresses in Fluid Dynamics Research: Proceeding of the Sixth International Conference on Fluid Mechanics (pp. 137-139). Melville, US: American Institute of Physics. Kim, Y., Xie, Z-T., & Castro, I. P. (2011). Numerical study of 3-D effects on dynamic stall of a wind turbine blade. In Proceedings of the 13th International Conference on Wind Engineering London, GB: Institution of Structural Engineers.